Mac N Cheese is a crowd-pleaser for the young and the old. Or at least I know I love it. It's one of those comfort foods that is easy to feed to an entire family, and is also great as leftovers. 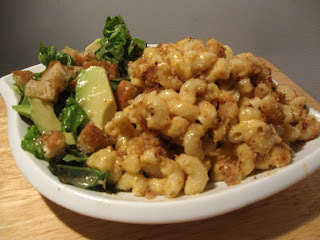 The other great thing about mac n cheese, is that really any and all cheeses work. As long as one of them is good at melting. So here is how I made mine. 1. Boil macaroni in a pot with salted water. And shred a big pile of cheddar cheese. 2. Put some butter in a large pan and melt it down. Slowly add flour bit by bit and mix it in to make a rue. Then add in your milk to the pan and mix with the flour. Once this mixture has mixed together and seems like a sauce, you can start to add your cheese into it to give it more flavour and body. 3. Pour macaronies into a casserole dish, and cover pasta with the cheese sauce. 4. Toast some bread crumbs in a pan in some butter. Make sure all the bread crumbs are soaked with the butter so that they won't burn. Put this crumble on top of the mac n cheese. 5. Cook mac n cheese in the oven for 45 minutes at 400 F. Cover for first half if you are afraid it will burn. ZOMG ... Homemade mac'n'cheese is my favourite meal in the world!